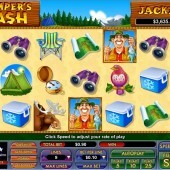 Camper’s Cash is the 5 reel, 9 pay-line slot from online slots developer NuWorks that offers you the chance to win big prizes against the backdrop of a funny twist on a traditional American camping holiday. Everything about this game is all about turning up the fun levels and making the slot as enjoyable as possible for you even before you have won a prize. From the cartoon graphics to the novelty dollar sign that substitutes for the ‘S’ in the Camper’s Cash logo, this game is intent on keeping you entertained. The real joy of Camper’s Cash is its simplicity. This slot does not become bogged down by complex bonus features and you certainly will not need a calculator or a PhD in Quantum Physics to work out what needs to be done to hit the jackpot. In Camper’s Cash, the Wild symbol is represented by the Camper himself. He is a guy with a wide smile who is desperate to help you win some prizes. He has the ability to substitute for all other symbols across the reels except for the scatter symbols and he also rewards you with prizes when he lands on a winning pay-line. The scatter symbols are represented by the Grizzly Bear. Do not fear, this bear does not intend to harm you or your efforts to win lots of cash. On the contrary, if you hit three or more of the Grizzly Bear scatter symbols across the reels then you will trigger the free spins bonus round. You will initially be awarded with 9 free spins to try and win prizes. The game also has an array of other symbols such as a deck chair, map, beer cooler, binoculars, sleeping bag, compass, tents and an assortment of other camping paraphernalia. 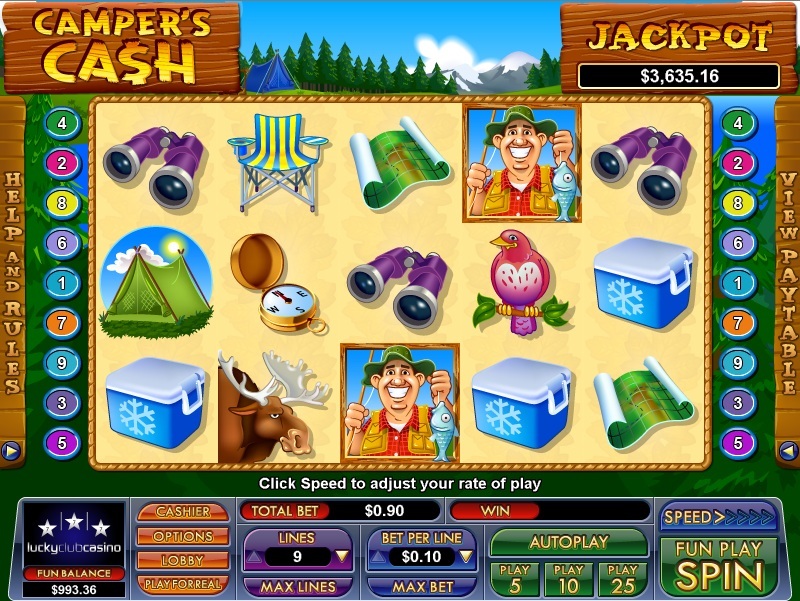 Camper’s Cash is not one of the most innovative slots out there but it is great ideal if you just want to play a slot that keeps it simple. There is a Wild symbol, scatter symbols and a free spins bonus feature. The game does come with a progressive jackpot which adds an extra level of excitement but there are no hidden bonus features or prizes for you to wrap your head around. This is fundamental slot gaming at its best.